Kelly and I would like to thank all of you for another successful ‘season of the loons’ here on Six Mile Lake. Special thanks to Jeff Combs, who pulled the platform and buoys from the north end and delivered them to our dock…not an easy job!! 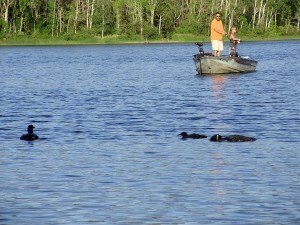 Everyone has been interested in monitoring both pairs and their chicks and it amazes me that, after living here for 33 years, and always hearing about the wild Canadian lakes and the haunting calls of loons, Six Mile Lake now offers that experience for all of us! Our friends and family are in awe every time they get to hear and see the loons and there are always lots of questions about loon behavior so I hope you find the following information helpful. First of all, both loon pairs returned and set up housekeeping on their respective platforms. The north pair are returning for the fourth year in a row and the female is banded with a white leg band and the male with a red leg band. 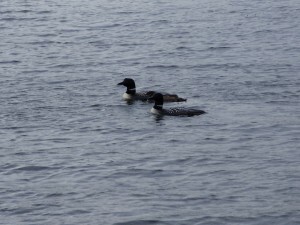 Both of these loons were banded here on Six Mile Lake. They have been successful nesting all four years and have one chick this year. The south pair have been together for two years and this will be their second year raising a chick. Last year they had two chicks. The female is an Intermediate Lake loon who was banded in 2010 and ejected from her territory there and came to Six Mile Lake in 2014. There has been no banding taking place in Antrim County since 2016 when the Loon Network disbanded and, as far as I know, there will be no banding this year either. If anything changes, I’ll let you know. For the most part both pairs stay in their respective territories and we have never heard of any disputes between the pairs. 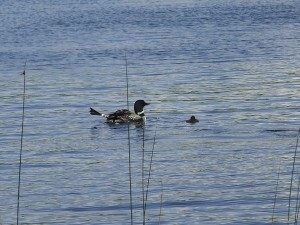 Sometimes, you will see several loons swimming in circles, diving, wing-flapping, running across the water, etc. almost as if their actions are synchronized. These are visitors from other lakes and territories. They could be young loons looking for their own territory or they could even be the offspring of the loons occupying the territory. This happens several times a week and is always accompanied by calls and lots of action. Eventually, the resident pair will run off the visitors and you know when this is taking place as the loons begin running across the surface of the water accompanied by lots of wing-flapping. Eventually, the visitors get the hint, leave, and the pair retrieves their offspring which hide in the weeds close to shore. Over the next three weeks you will see the parents trying to teach the chicks to fly. Eventually, one of the parents will leave, usually late August, then within a couple more weeks the other parent leaves and the chicks, which are teenagers now, are left behind for another four weeks or so and then they too, are gone. Once both parents leave the lake falls silent again until ‘ice out’ in April of the following year. The destination for loons is the coast of Florida, where they lose their brilliant black and white plumage and turn gray like their offspring who will soon join them. What they do there I can’t tell you but in the spring they fly north to resume mating and raising their families once again. The offspring will stay along the coast for three years then the males will return to their northern territories where they may or may not attract a female and attempt to set up their own territory. Blue, our very first male loon, produced two chicks in 2012 and one was banded with a # 89 yellow leg band. He returned in 2016 and is now on Moblo Lake (private) about five miles away. Just so you know, females do not return to their natal territories but to completely different areas to seek a mate and start a family. Late in the summer and into early fall it is possible to see large groups of loons gathering and socializing before flying to their southern destinations. As far as I know, loons do not travel in large flocks but that is another topic for another time. In the meantime, enjoy the next month with our beautiful loons, because, too soon, they are gone!!! !